In his maiden visit to Upper Subansiri district today, Chief Minister Pema Khandu inaugurated and launched a number of development projects to improve road connectivity and provide effective administration in the remote Dumporijo constituency. Dumporijo MLA Pakgna Bage and Daporijo MLA Dikto Yekar along with several public leaders and local government officials welcomed the Chief Minister after he arrived at Maro helipad in the morning. The CM was accompanied by Health Minister Jomde Kena, BJP state president Tapir Gao, BJP National Secretary Ramesh Kadaganchi and former AAPSU leader Gumjum Haider in his visit to Baririjo headquarters in Dumporijo constituency. On way to Baririjo on road from Maro helipad, Khandu launched the 21.51 km Maro-Baririjo PWD road to Riko village constructed under PGMSY scheme. The construction of the road commenced in 2013 at the cost of Rs 14 crore. 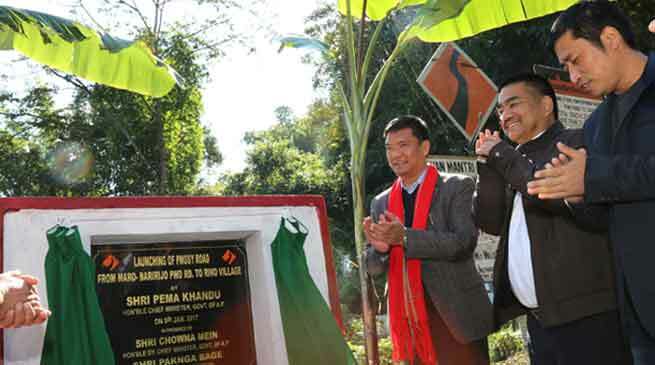 He also launched the 36 km PMGSY road connecting Sie bridge point to Lebri village. Before proceeding for a public meeting at Baririjo, the Chief Minister inaugurated the sub-divisional office building at Hakte-Ripa, which was constructed under SPA in 2014-15 financial year. Khandu announced to fund various other road projects in the constituency of worth Rs 7.25 crores in the current financial year with assurance to fund more in the next financial year for the proposed schemes as submitted by Dumporijo MLA. Other projects such as 11kv LT lines for Hakte-Ripa SDO headquarters, construction of IB and a helipad at Sigi-Gusar were also assured. The Chief Minister in his public speech appreciated the development initiatives in Dumporijo achieved under MLA Bage within two years. The CM appreciated his initiative in maintaining transparency of all projects through records maintained by publishing booklets with detail information, which he said is a step taken for the first time by a legislator. Khandu further appreciated the local legislator’s funding proposal for all the ongoing and proposed projects in Dumporijo constituency on 70:30 basis, according to which 70% funding will be from CM’s discretionary funds and 30% from MLA sources. This is a case heard for the first time, wherein normally legislators seek 100% funding through Chief Minister on the proposed projects, said the CM. Khandu regretting the recent political disturbance said that he had tried his best to take along all the legislators. For equal development of all constituencies, he said the state government had even sanctioned Rs 10 crore for each constituency. The CM said since the state has scarce funds, the demands of the legislators sometimes become difficult to be met and he had only asked for time to fulfill their demands. The Chief Minister assured the people that the government is now stable and safe. He stressed that for development, stability is essential and regretted that much time was lost in past political disturbances. Khandu said that with stability achieved, the state can now smoothly move ahead towards development and could soon expect a financial package from the centre. He informed that during his last visit to New Delhi, he had met Union Finance Minister and had worked out on the proposals from the state for financial assistance. Bage in his representation proposed for a hydro power project in Sie-basin, with proposal to be executed by NEEPCO Ltd. He also sought help of the state government for shifting of govt. degree college, Daporijo to its permanent site in Jeram. Gao in his speech said the BJP is committed to state’s development with the mantra of ‘Sabka saath, sabka vikaas” taking along people from all religious and community background. Health Minister also spoke on the occasion.